Step back in time and relax with a vintage bathroom. Leave the stress of the modern world behind. Antique home decor adds a special charm to any space. The scale and materials feel very different from today's home accents. Medicine cabinets are often placed directly above a bathroom sink, so it's important to have an attractive one to look at while you spend the obligatory two minutes brushing your teeth. A mirrored medicine cabinet plays the dual role of storage space and mirror. There are usually hundreds of antique medicine cabinets on eBay. Click Here to see what's available. Recessed or Exposed Medicine Cabinet? We have very small bathrooms so I prefer recessed medicine cabinets with mirrors. However, that choice means that I sometimes loose the details along the side. So if I really like an antique medicine cabinet with fabulous side details, I leave it exposed. I have found that many older medicine cabinets are made from oak wood. It's very attractive and can easily be stained to match the wood already in the bathroom. Over the years, original the original doorknobs and latches may have been replaced with more modern ones. It's very easy to find antique knobs and latches on eBay, at flea markets and estate sales. They can be quickly switched out. This is really worth the effort, if you have an antique home and want it to reflect an earlier time period. Besides when you're looking for these small details, you never know what else you'll find! It's very common for a medicine cabinet to have a mirror in it. 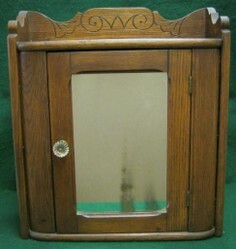 When you buy an antique or vintage medicine cabinet, the mirror may be worn out or a very poor quality. It's easily replaced with a new one. You can even find a mirror with decorative details around the edges. Some antique medicine cabinets actually have glass panels. That's fine if you always have a tidy cabinet and don't mind if your guests see what is in your medicine cabinet. I would probably use this style in a private bathroom area. That would be very important if the cabinet contained certain drugs. I restore and repair everything that goes in my home. This is actually very controversial. Some purists believe that antiques should be left to show any distressed or broken areas. I want them to be in wonderful condition and look as good in my home as they did when they were new. This does diminish the value in some peoples eyes. So you have to consider whether the future resale value is important or not.